Kate is a project manager for bigger dot. Whether you've printed books, posters, direct mail, corporate collateral, brochures, or anything else with us, she likely helped make it happen. She studied art history at Cal State Long Beach, and is extra passionate about all things art and culture. She didn't write this bio but her own words are below. Here are her five favorite FREE art & culture-related activities in Long Beach! If you haven’t been to the Museum of Latin American Art, you’re missing out! It’s one of Long Beach’s *best* treasures, and I adore it wholeheartedly. Founded in 1996, MOLAA is the only museum in the US devoted to modern & contemporary Latin American Art. Wow!! The museum hosts rotating exhibitions highlighting a diverse array of artists, mediums, and artwork - including the kind of printed work we love so much here. I love stopping by on Sundays to visit their sculpture garden and meander through their current exhibitions. Also, you can catch me there on the occasional Friday night for their awesome guest lecture and art event series. Check out their calendar for event info. The Long Beach Museum of Art is super dreamy. It’s housed in the historic 1911 Elizabeth Milbank Anderson House, which overlooks the Pacific Ocean. The view of the water from the second floor galleries is stunning. And the art inside is great too! LBMA features rotating exhibits year-round, focusing on cutting-edge topics like new media, street art, commerce as subject matter, and 3D interactive art experiences. MADE by Millworks is a retail space and art gallery that hosts artists and makers studios on site. Inside, you’ll find unique embroidery, divine soy candles, upcycled leather goods, delicious beef jerky, handcrafted ceramics, salsas, and more. It’s delightfully easy to lose yourself in browsing all the joyful little items for sale, and to contemplate the intersection of art, commerce, craft, and everything in between. Although MADE is free to visit, I do feel a little guilty including it on my list of free things, because it’s ~extremely~ difficult to leave here without buying something. But still totally worth the visit — and hey, buying something here means supporting local makers! WHEN: Free admission all day, but good luck not spending money! The Earl Burns Miller Japanese Garden is hidden away in a quiet corner of Cal State Long Beach, and will bring some peace into your life. The curated space is maintained by students and staff, who meticulously care for and groom the natural elements of the garden. The garden’s careful combination and fusion of art and nature creates a space for meditation, contemplation, and reflection. I love coming here when I need some extra serenity in my life — to sit and be surrounded by the beautiful pines, maples, orchids, and ginkgo trees. Long Beach has a ton of AMAZING street art and large-scale murals, largely thanks to the work of Pow! Wow! Long Beach. Pow! Wow! Describes itself as a “global network of artists and organizes gallery shows, lecture series, schools for art and music, creative community spaces, concerts, and live art installations across the globe.” Beginning in 2015, Pow! Wow! started sponsoring week-long large scale mural creation within the city of Long Beach. Walking around downtown and admiring the murals is one of my favorite weekend activities. It’s so neat to see how public, large-scale art can bring a city to life! Also, behind the scenes tip: a lot of our Instagram photos use Long Beach murals as backgrounds! 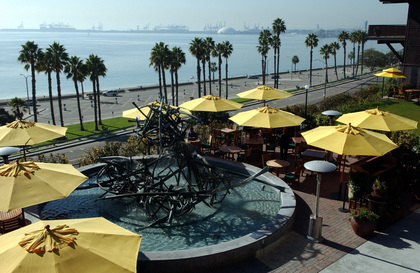 Thanks for reading Kate's five favorite free art and culture things to do in Long Beach! For more great content, be sure to subscribe to our mailing list. And if you ever need anything printed, get in touch!